Did you know that the Irish had a major part in the victory on the bloodiest day in American history? It was at Antietam on September 17, 1862, and it was the victory that emboldened President Lincoln to issue the Emancipation Proclamation. Foremost among Union forces was the Irish Brigade led by Irish-born Gen. Thomas F Meagher. Their story is an extraordinary chronicle of military valor in America’s cause; once when President Lincoln visited General McClellan’s Union camp, he lifted a corner of the Irish Brigade Flag, kissed it and said Thank God for the Irish! In early August, the Brigade pursued a Confederate division which halted just before the town of Sharpsburg and turned to await the incoming Union forces on the west side of Antietam Creek. The Irish halted on the east side, where Gen. McClellan set up HQ. Meagher wanted to attack, but McClellan waited for more units, but so did the rebels. By September 17, when McClellan finally ordered an attack, the rebels were in the area, in position, and in strength. At 6 AM, McClellan sent the 1st, 12th, and 2nd Corps in turn across the Antietam, but held the Irish Brigade back to defend HQ. Anxious to get into battle, Meagher watched as the Union forces broke in retreat, one after the other; At 9 AM McClellan finally sent Meagher’s Irish across the creek. Some gratefully soaked their feet which were so swollen that they couldn’t get boots on; they’d been fighting barefoot. Across the creek was a rise, and beyond the rise was 300 yards of open ground which ended at a sunken road. Over the years, farmer’s traffic had worn the road down so that it was 3 feet below ground level, forming a perfect trench, now filled with Confederate troops who devastated the oncoming Union troops with deadly fire. Meagher ordered his men forward and, as they crested the rise, he rode to their front, drew his sword and shouted, Irish Brigade, Raise the Colors and Follow Me! 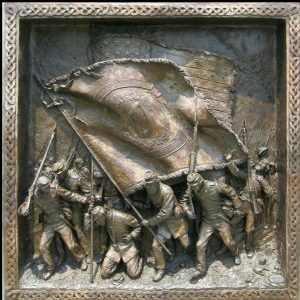 The Union wounded, strewn across the field from the morning’s carnage, cheered as from the sunken road was heard, The Irish Brigade is coming. The rebels could hear the Irish cheering as the colors appeared over the top of the rise, first the streamers, then the flags: emerald green, then red, white, and blue. Then the Brigade appeared in a perfect line, as if on parade, rifles at the ready. The rebels rose up in the sunken road, leveled their muskets and fired. Death struck the Irish front. Every rebel bullet seemed to find its mark as the Brigade crossed the field. The emerald banners of the Brigade were special targets and were repeatedly lifted as color bearers were shot down. Capt. Clooney retrieved the colors of the 88th as they fell and was immediately shot in the knee. Using the staff as a crutch, he urged his men on. Shot twice more, he died enshrouded by the emerald silk of his regimental banner. A young private, lifted the flag from Clooney’s body and waved it defiantly at the enemy. The regiment roared its approval and charged into the hail of bullets. Behind them, Gen. Caldwell led his men crossed the creek. He saw the 63rd and 88th being shot to pieces but, intimidated by the carnage, held back awaiting Gen. Richardson to arrive and take command. The Brigade, now more than 30 minutes in a fierce face-to-face fire-fight, was being cut to pieces. Meagher rode to the rear and pleaded, For God’s sake, come up and help! Col. Barlow replied, I’m truly sorry General, but, my orders are to remain here. Meager angrily rode back into battle and his horse was hit, fell, and rolled onto him leaving him injured. Meagher was carried back to a field hospital, as the ranks of the Brigade slowly diminished and ammunition was running low. There was nothing glorious about this fight, it was a bloody brawl, but Irish gradually got the upper hand. Virtually every rebel officer had been shot and the sunken road that provided them such great cover now looked like a mass grave with rebels covering every square inch of ground. The contest was too much for the rebels; braving the Irish fire, they bolted from the sunken road, and fled to the rear. The remaining Irish began to cheer when suddenly, from beyond the fleeing rebels, came fresh reinforcements! They ran into the sunken road, and straight out the other side charging the Irish. Instead of retreating, the Brigade stood fast, leveled their rifles, and fired into the charging rebels breaking their attack with a single volley. As the rebels regrouped for a counter attack, the surviving Irish looked nervously over their shoulders; where was their relief ? and ordered his men to relieve the Irish. The Brigade, still firing into the Confederates to keep them from regrouping, knew that one more attack would finish them. Then, just as the rebels were climbing out of the sunken road, Caldwell’s men entered the field behind them shouting, three cheers for the Irish Brigade. The Irish saw their reinforcements coming up the rise and a sense of pride surged through them. With a roar, they sprang to their weary feet and led the attack with Capt. Joyce shouting, Forward for St. Patrick and Ireland. This was the final blow! The rebels had fired cases of ammunition into the Irish, only to see them attack again and again with incredible arrogance. Now, just when the rebels thought they had them finished, the Irish had the audacity to attack them! The confederates broke and ran. Surrounded by dead and wounded comrades, the Irish stood at the edge of that road so dearly bought, and watched them go. Gen. Richardson, transfixed by the carnage before him, watched as the Irish turned their backs on the fleeing enemy. 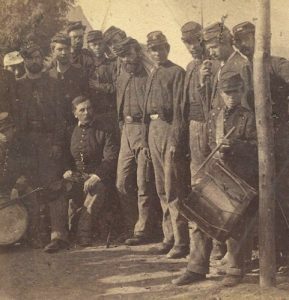 Then, with their tattered and blood stained flags proudly flying, they formed into ranks, as best they could, and marched down the rise to the cool waters of Antietam Creek amid the cheers of every man in sight. The unattainable sunken road was now the Union front line; that costly barrier that couldn’t be breached had been won by the Irish Brigade, and they gave it the name by which it would evermore be known – Bloody Lane. They were only a few of the Irish who made America great!